Sign up for the new release newsletter! Simon & Elizabeth are back! Soon. No really! Book 11 in the Out of Time series is almost here. ​Be sure to sign up for the new release newsletter so you don't miss it! Simon and Elizabeth Cross are enjoying a romantic mission in 1936 Miami when things go south—literally—to Rio de Janeiro. The mysterious artifact they've been tasked to retrieve isn't sitting in some museum in Florida; it's buried in the Lost City of El Dorado hidden in the darkest jungles of Brazil. As if trekking through a jungle where everything wants to kill you--including cannibals--wasn't dangerous enough, they also have to deal with a ruthless archaeologist who will stop at nothing to find the Lost City and a pair of Nazis hellbent on bringing the power and the glory of the artifact back to the Führer himself. Unless Simon and Elizabeth can find El Dorado and the artifact first, history will be forever changed, and not for the better. 'Cause, ya know, Nazis. 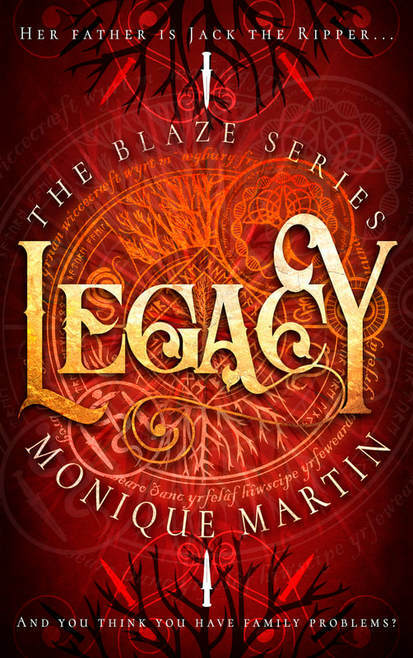 Book 3 of the Blaze Series Is Here - Legacy! Artemis has hit her stride as the Blaze. By day her friendship with Liam blossoms, and by night she's the Champion of Light, protecting London from the darkness. Everything's going her way--when a dark stranger from her past appears. Her biological father, Jack the Ripper, is back, returning through a tear in the Veil between worlds. He claims he's left his evil ways behind, but leopards and murderous psychopaths don't change their spots, and his nefarious plans go far beyond seeing his daughter again. If he gets his way, Hell will literally be unleashed upon the earth. Haven't tried the exciting new Young Adult Historical Fantasy from Monique Martin? Try it today! All Artemis wants for her 16th birthday is a fancy new dress and maybe a few stolen sips of champagne. What she gets is a fiery sword and an inescapable destiny. She’s the Blaze—fated to protect the city from Darkness. With all of two days training, she must strike back against a rising evil. But her new powers come at a cost, and the truth behind them is more terrifying than any monster. Miss Simon & Elizabeth? Don't Worry! Their adventures aren't over yet. Look for a new book in the Out of Time series coming soon! Make sure you haven't missed one. 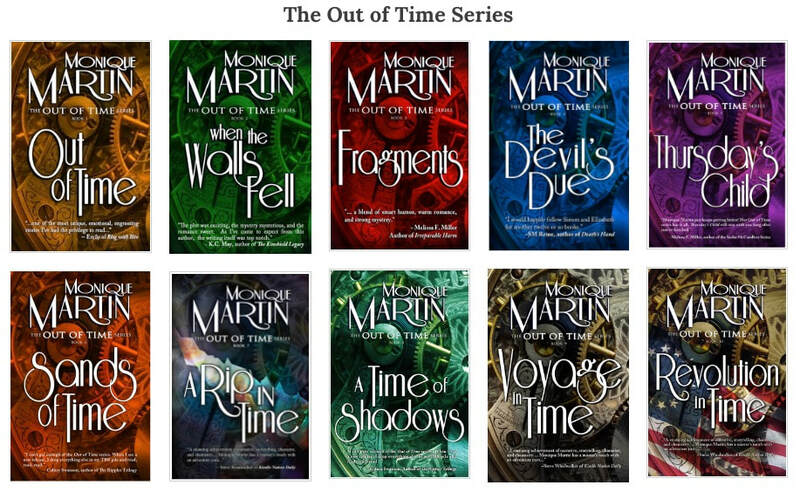 Check out the Books page for a reading list and links to all of the books in the Out of Time and Saving Time series. Romance, adventure, mystery and time travel. Professor Simon Cross and his assistant Elizabeth West unwittingly discover a time travel device and the mysterious Council for Temporal Studies. Their adventures back in time put their wills and intellects to the test as they solve mysteries, prevent murder and perhaps even save the world. These best selling novels are available on from most major retailers in both paperback and ebook. "I'm not an occult fiction guy. I don't read vampire novels or zombie novels or time-travel novels. But I read Out of Time and it is such a stunning achievement of narrative, storytelling, character, and chemistry that I'm forced to go beyond my usual reading repertoire to give you a sense of its power. One of those 5-star reviewers conjured up the notion of Indiana Jones meets Dr. Who to describe one of the main characters, and the other, Elizabeth West, is a creation worthy of a contemporary Jane Austen. Monique Martin has a master's touch with an adventure yarn, so much so that the paranormal aspects of the novel seem almost, in a way, incidental. I could go on, but all I want to do is to tell you: this is a great read that will sweep away men and women alike." Monique Martin is a participant in the Amazon Services LLC Associates Program, an affiliate advertising program designed to provide a means for sites to earn advertising fees by advertising and linking to amazon.com.